Help Victorius restore broken roads and settlements! The Roman Empire is flourishing, everything seems to be quiet and peaceful. Our well-known characters Julia and Victorius are absolutely happy awaiting the birth of their first child, and it looks like there’s nothing threatening the glory of the Great Kingdom. However, one day a messenger arrives in Rome spreading the bad news about Barbarians that are destroying the Roman provinces. No one but Victorius and his army can resist the enemy and protect Rome from the forthcoming disaster. There is nothing else left out for Victorius, but to set off on a journey to fight the enemy! Be brave and the good luck won't leave you, clear up your way and build roads, help the Romans gain their prosperous and peaceful life back! 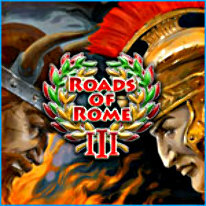 Restore broken roads and settlements, save the Roman Empire from barbarian invasion!